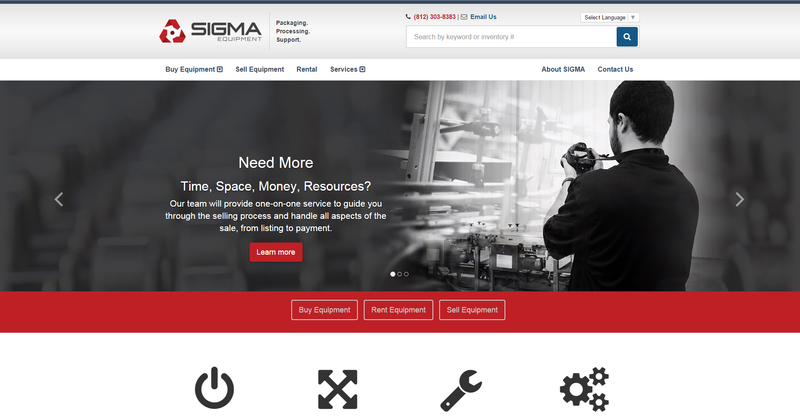 Evansville, IN, June 29, 2015 – Today, SIGMA Equipment, formerly Sigma Packaging, launched a new website at www.sigmaequipment.com. The website contains new features, such as enhanced category and manufacturer pages, improved site navigation and a more precise search function. Perhaps most importantly, the new website is mobile-friendly. "We spent a lot of time working on the user experience for this website so that our customers can find what they need quickly and easily," said Patrick Johnson, SIGMA Equipment IT Developer. "The categories are more organized, the search function is more powerful and the navigation is more intuitive." One of the new features on the website is the "Wanteds" page. If a customer can’t find the equipment they need listed among the items for sale, they now have the option to create a wanted listing. When sellers check the Wanteds before listing an item for sale, buyers may be able to find their requested equipment more quickly. Another website feature is the improved process for uploading equipment for sale. The new feature guides sellers through each step of entering the specific information about each machine. After the seller completes the item details, the site suggests ways to improve the listing, such as updating fields that were left blank, or adding photos. SIGMA Equipment has created new buyer services, including equipment reservation, set to size, and other services provided by SIGMA’s on-site repair shop. New seller services, such as Asset Management and Merchandise Credit represent SIGMA’s continuing effort to offer sellers individualized options that best fit their business needs. These new options are designed to save time, money and resources for customers. "Our goal with the new website is to make sure we are offering both buyers and sellers the best experience possible when they choose SIGMA," said Rob Palmer, SIGMA Equipment founder. "Innovative technology and excellent service are what position SIGMA as a leader in the used equipment market, and this website reflects that." The transition from Sigma Packaging to SIGMA Equipment is ongoing, and expected to be complete by August 1, 2015. For more information about the services offered by SIGMA Equipment, visit www.sigmaequipment.com.